White gold color. Fruity, tropical, confected aromas and flavors of mango gelato, coconut macaroon, and orange blossoms with a supple, bright, effervescent, moderately sweet medium body and a smooth, stimulating, medium-long finish that shows impressions of fancy bubblegum, tropical fruit punch, and banana custard pie with fine, soft, fruit tannins and no oak flavor. A very tasty tropical flavored treat. Bottom Line: A very tasty tropical flavored treat. 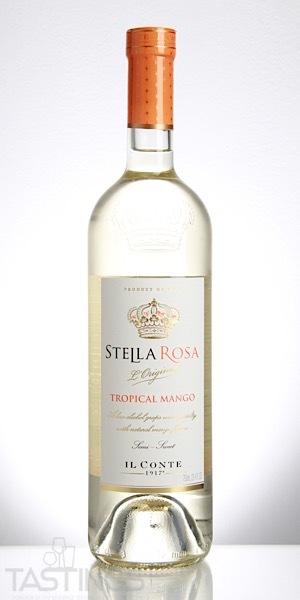 Stella Rosa NV Tropical Mango Flavored Wine, Italy rating was calculated by tastings.com to be 90 points out of 100 on 9/17/2018. Please note that MSRP may have changed since the date of our review.